Saturday was not a day for the faint-hearted at Bishopscourt on with all the seasons hitting the County Down circuit at the northern round of the Mondello Masters series. East Antrim’s Nikki Coates, riding the Kingsbury Packaging Kawasakis, was happy with his three podium places and a race win on the day. In the opening supersport race the local rider was involved in a five-way scrap for the lead with Jason Lynn, Ross Patterson, Dan Kneen and Luke Johnston. Both Coates and Lynn took turns at the head of the pack but on the final lap with Lynn leading Coates, who crossed the line first, was adjudged to have passed under the yellow flag, which he disagreed with. In the incident Lynn crashed out of the race and at the end of the meeting Coates was stripped of his win by the stewards. Ross Patterson, who initially was second, was awarded the supersport race one win after Coates was disqualified. Coates’ next race was the superbike event and the local rider made a great start leading before it was red-flagged due to Cody Nally and Gerald Kingham crashing out. Only a couple of laps into the re-run superbike race a massive accident involving reigning Irish champion Ryan Rainey and Seamus Elliot brought out the red flags again. After a long delay the superbike race was run later in the programme but was red-flagged for the third time, this time for a massive hail shower. Nico Mawhinney took the win with Coates second and Dan Kneen third. In the second superbike race rain came into play as Mawhinney completed his double with this time Kneen second and Coates third. 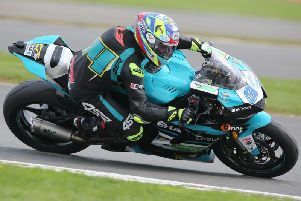 Coates, however, did take victory in the second supersport race. Lynn, on the Carrick-based Walter Bell Suzuki, led for most of the eight-lap race but Coates made his move at turn one on the final lap to lead and hold off Lynn to the chequered flag. “I have raced in many conditions throughout my career but that was the first time in a hail shower,” laughed Coates. “I was happy enough with my results. The bikes were going well and I suppose I now need to get that first win on the superbike. It was weird leading the first superbike twice, only to be red-flagged because of the incidents but to stop it for a third time because of hail tops it all. In the other classes there was local success for Carrick’s Ashley McLernon in the Superbike Cup race one when he brought his McLernon Racing BMW home in third place. Glengormley’s Paul McCrea had a win and a third in the pre-injection class on his Yamaha.